I’ve had eyebrow envy for as long as I can remember. My eyebrows have always been sparse with thin and super fine eyebrow hairs. So about 20 years ago I decided to take the plunge and get my eyebrows tattooed. What a mistake that was! Now, still unhappy with my tattooed brows I’m forever filling them in with liner and powder to cover the horrible mess I’ve had to endure the last 2 decades. 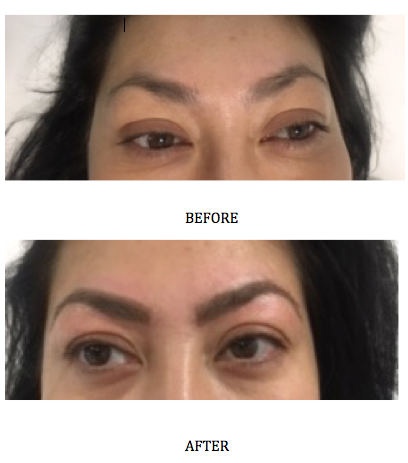 Recently I heard about the new techniques in semi permanent eyebrow resurrection or microblading. I booked my appointment at Browhaus, located in Chelsea, hoping that I could finally have the eyebrows that I always envied. Browhaus is located above the most adorable farmhouse chic coffee house with the theme that runs all the way though the entire establishment and in keeping with the same decor theme of Browhaus itself. I was a bit anxious because of my past horrible eyebrow tattoo decision, but the technician, Vaso puts me at ease. We started off by discussing what exactly eyebrow resurrection was, the application process and she melted all my fears away. She drew on my eyebrows, so we could determine the best shape for my face and numbed my brows. A small blade was used to deposit ink throughout the brows with upward strokes, so to looked like strands of hairs. After about an hour she ran more ink into the brows and I relaxed for 20 minutes. Finally, it was time for the reveal and I’m astonished by how natural they really do look. They are big and bold with what looks like real hairs, but in reality just the skilful work of the experienced technician. I am so happy with the look of them and now have brows like Kylie Jenner! The aftercare is minimal, just some ointment in the morning and some also applied at night. They do recommend a touch up 3-6 months after the procedure depending on your lifestyle and how active you are.